Svend Hvidtfelt Nielsen (f.1958) har en enestående traditionsbevidsthed, samtidig med, at han er i stand til at skrive pågående og rytmisk markeret musik. Denne nye CD cirkler om et lillebitte, frapperende dansemotiv som kommer på afveje - nogle gange ligefrem på vej mod et sammenbrud. Hvidtfelt Nielsen har i en årrække været huskomponist hos Randers Kammerorkester hvis dirigent, David Riddell, her viser vej gennem fandenivoldsk dans, forbigående idyl og farlige omveje. "Hatten af for Helge Slaattos og randersmusikernes tackling af udfordringerne på cd'en"
"He has a way with delicate instrumental color and texture. Although not, perhaps, for the casual listener, the dedicated will be rewarded." Toccata for violin og nonet 22:44 19,20 kr. I Moderato con trasparenza 4:55 6,40 kr. II Allegro agitato 2:12 6,40 kr. III Sereno intimo quasi senza tempo (Canon) 4:54 6,40 kr. I Brillante con trasparenza 3:05 6,40 kr. II Calme - grazioso con eleganza 4:33 6,40 kr. III Giocoso 0:50 6,40 kr. IV Poco danzante, con eleganza 2:35 6,40 kr. V Allegro - Danzante 2:31 6,40 kr. I Molto agitato, danzante 3:14 6,40 kr. II Calme 1:22 6,40 kr. III Fluente 0:53 6,40 kr. IV Intimo 1:49 6,40 kr. V Furioso 1:36 6,40 kr. We stand on one another's shoulders in composition music,\ Svend Hvidtfelt Nielsen said in an interview a good ten years ago. The words were uttered in Mariendal Church in Frederiksberg, where Hvidtfelt has been employed for the past 20 years as organist. And consciousness of the tradition is indeed clear in the works on this CD by the 53-year-old composer. On the one hand we note again and again how Hvidtfelt's feeling for style and technique engages in a constant dialogue with all the methods established by composers of earlier times. And at the same time we sense that his music is put together in more or less the same way as composers have approached the task for centuries; that is, by seeing music as a kind of artistic problem to be solved; a problem that emerges precisely as the music begins: how does one proceed logically and properly with new surprising elements from an introductory theme without losing sight of the fact that music assumes form as an integrated totality? In no sense does this mean that Svend Hvidtfelt Nielsen's music sounds old-fashioned or retrogressive. It means that the music has been created with an ear for harmony and rhythm, sometimes with quite medieval thinking about good part-writing - while at the same time the aesthetic belongs to the composer's own generation. As a young man in the 1970s Hvidtfelt wrote songs and played rock music in bands like so many others his age, and only afterwards acquired his classically comprehensive training at the Royal Danish Academy of Music both as an organist and as a composer - and in fact also as a graduate in musicology and philosophy from Copenhagen University. So although the consciousness of tradition is quite naturally clear, the wish to write insistent, rhythmically marked music is equally present. It is therefore quite natural too that the man's new CD centres on a tiny, striking dance motif. 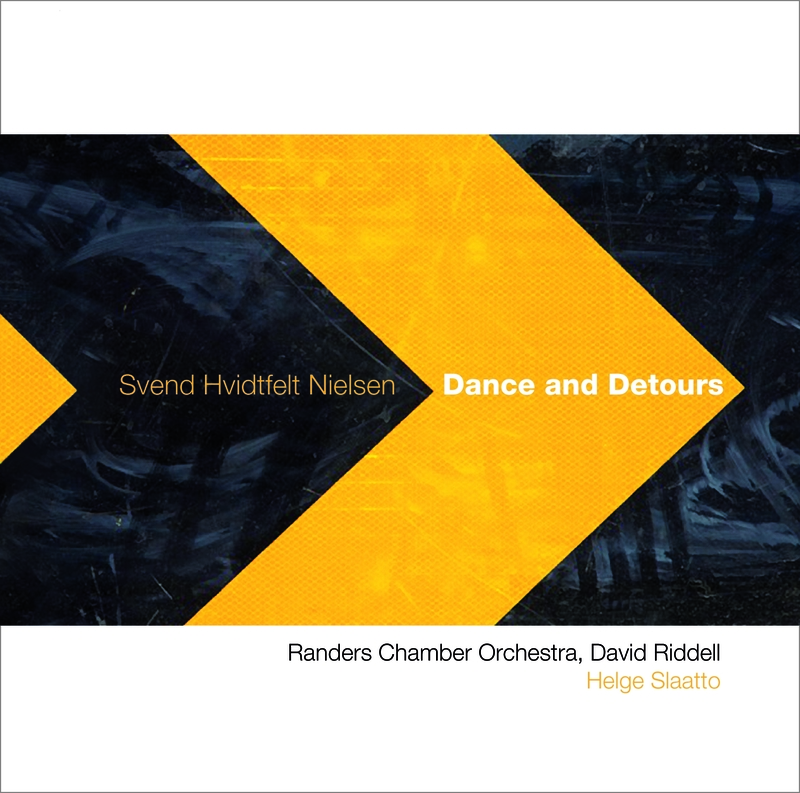 The story behind this is that Hvidtfelt won the Randers Chamber Orchestra's composer competition in 2001 with the suite Of Princes and Dreams, and this was the beginning of a fruitful collaboration. The orchestra took on Hvidtfelt as its composer-in-residence, and his time with them has led to both Dance and Detours and the devil-may-care solo violin piece Aria and Dance, written for the leader of the orchestra Helge Slaatto. The longest and most wide-ranging piece on the CD, Dance and Detours, is more a small violin concerto for nine musicians and a violin than a chamber piece. And its sub-title is in fact Toccata for violin and nonet. The music too develops a little like a classic solo concerto, with light-footed passages at the beginning, a lingering middle part and a fast finale. But there is also a great deal in the work that is not particularly traditional. The last word in the title, ‘Detours', means that things can go a roundabout way or even go off the beaten track - and it is in this part of the music that the listener is against the ropes. The dance is easy enough to understand as long as you just listen a little with your body. The problem is formulated here as two notes that change quickly as the little recurrent motif. It is as simple as guitar rock or a techno beat, except that is it staged with classical musicians. The detours are instead the story of the violin, which again and again goes off the track and is in various ways about to break down. After the fast beginning we follow the solo instrument all the way up to the clouds, where it is joined by the flute and the other strings, all of which play according to the instruction ‘various random notes right at the top of the instrument'. They prattle and whistle like an aggressive chorus of birds. In other places the distinctive sound of the violin becomes gritty and noisy, because the violinist is asked to press down far too hard on the strings with the bow. And at the end of the piece, before the dance wins in the finale, notes and sounds emerge that are outside time and place, as if the music is falling apart. The many detours are succeeded by something much more reliable in In der Abendstille: three small atmospheric pieces for the distinctive ensemble flute, oboe, bassoon - and harpsichord. It is music as tone-painting, where the three lamenting, melodic woodwinds form a united, dynamic front against the harpsichord, which as the crisp keyboard instrument of the Baroque can vary neither timbre nor volume. True, something unpleasant is lurking in the quiet music of the twilight - we hear a good deal of it in the middle passage - but delicate poetry in long melodic notes and sparkling trills are the most evident features of the soundscape, at a tempo where most people can keep up. Long, tied notes sound under character descriptions like cantabile, expressive, very soft or innocent. It is this kind of idyll that the harpsichord is allowed to protest -vehemently against in the second movement, where Hvidtfelt's stage direction says almost everything: ‘highly rhythmic and a little brutal'. But just as the dance in the first piece got through the detours, the woodwinds with their singable, expressive melodies also win the battle here. A happy end was also on the cards for Hvidtfelt's chamber opera The Little Mermaid for the Funen Opera in 2000, from which the suite Of Princes and Dreams comes. In the work on the opera Hvidtfelt took leave of some of the complicated rhythmic and tonal principles that dominated his music in the 1990s so he could write magical music that was a match for Hans Christian Andersen's famous tale. So although it is an independent musical context, it is still a sound-world rich in images that the suite offers, with sparkling marimba, simple melodies and warm string sounds. In the five movements we have the prince dancing with his mermaid, music for the table and the ball from the opera with quick, energy-filled progressions first and last, and a cooler, gentler sound-world in the second and third movements. The CD comes to an end with anything but quiet violin music. The five small movements of Aria and Dance for solo violin greatly recall the Baroque composers' way of running through all the possibilities on an instrument in a suite of five small pieces, each of which takes its cue from a long-forgotten court dance. In Hvidtfelt, though, the suite is not something one should try to dance to either. The first movement is a concentrate of both dancing and detours, the second movement lays forth an expressive song, while the third movement recalls the dance from before, but as a fluid, coherent, unquantifiable reminiscence. The fourth movement is a beautiful winding song again, until the violinist is allowed to show what he is made of in an inciting rhythmic web of stresses and displacements. And so one has in fact experienced a fair run-through of Hvidtfelt's way of composing - in five minutes. Henrik Friis has a master's degree in musicology and is a music reviewer on the newspaper Politiken.